a saint for all times, a saint for all people. Today, Oct. 4, Christians around the world remember one of the great heroes of our faith, and the current pope’s namesake. Thanks to those of you who joined our celebration of this great saint by praying the Solemn Novena to St. Francis for the last nine days. We were 3,400 people strong in our prayers. We hope you were able to feel the power of those prayers. Francis preached peace in a time when life without war was unthinkable. He embraced the poor while others treated them with scorn. And he allied himself with nature centuries before humanity understood its connection to every living thing. Eight Hundred years later, we Franciscans are still inspired to walk and follow in his footsteps. If you would like to say this novena on your own, you can go to this link and find the prayers each day. Sign up for Fr. John’s monthly e-newsletter to keep up on the latest Franciscan happenings on this page under Get Updates or click here. "The great poem by St. Francis, The Canticle of the Creatures, sums up the whole of Francis' spirituality," says Fr. Murray Bodo (the voice of our St. Francis Novena). Fr. Murray explains his connection to St. Francis through their mutual love of words in the video above by Franciscan Media. the glory and the honor and every blessing. for he heralds you, Most High. through Sister Moon and Stars. lightsome and precious and fair. and colored flowers and herbs. and who bear sickness and trial. who die in mortal sin! Post your prayer requests on our Prayer Page. Fr. Murray Bodo, OFM, is a writer and poet, his newest book, Surrounded By Love: Teachings from Saint Francis, will be released mid-October. Pre-order your copy through Franciscan Media now. 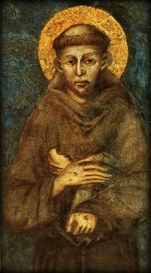 Videos and articles on St. Francis at Franciscan Media.